Much like it’s popular predecessor the “Hammer” EQ, the “Nail” Compressor it incorporates a hybrid tube circuit on the output stage of the device. By simply inserting the Nail into the signal chain, the source material automatically has that classic tube warmth. But this is only the beginning. The Nail raises the bar for other compressors on the market by being the new swiss army knife of gain reduction with a wide range of features that can be used for multiple applications. At first glance, the custom milled aluminum knobs and faceplate make the two rack space unit stand out in a rack just like a vintage piece of gear would. Behind the grill are custom potentiometers made from a special conductive plastic. These pots, compared to a traditional carbon based pot, have a longer lifespan and are less likely to develop the scratchiness sound that dirty carbon pots often lead to. Next is the LED metering. Compared to the traditional VU meters seen on other compressors, the LED meters blend the “old school” look with the modern and (more importantly) can easily been seen from across a sometimes dark control room. The Nail compressor has taken a proactive approach for handling gain reduction by implementing a Threshold and a Hard Threshold. The Threshold is designed to act as the gain reduction. Simply put, the more you turn the knob, the more gain reduction is applied to the source material. This functions much like the soft knee of a Urei LA-2A. The Hard Threshold is setup to act more like the traditional Threshold function of a typical compressor. Once the amount of gain reduction that is needed has been dialed in with the Threshold control, the Hard Threshold can be used to fine tune at what point the gain reduction actually starts to take effect. Since there is no ratio setting, these two features along can be used for a multitude of applications including applying a minimal amount of gain reduction, setting the device up as a peak limiter or anything in between. The manual Attack and Release settings may or may not be needed depending on the settings of the Threshold and Hard Threshold. If the Threshold is only thing in use, they aren’t that critical because the amount and speed of of the gain reduction is being controlled by the input gain. But, once the Hard Threshold is engaged, the Attack and Release can be used to dial in how fast or slow the gain reduction is taking effect. One really unique feature of the Nail is just how far you can go with the Attack setting. By pulling back the Attack to a fairly fast setting (and applying a good bit of gain reduction) the Nail keeps the sonic integrity of the source material even under severe amounts of gain reduction. Another feature of the Nail is the Variable High Pass Filter that’s Built into the side chain (i.e the detection circuit). A typical compressor will react to the entire frequency bandwidth of the source material it’s being fed. Since low frequency information is typically the largest source of energy that drives a compressor, the bottom end (250hz and below) can trigger the threshold of a compressor and reduce the dynamic range of the entire frequency spectrum. With this unique feature, the Nail can somewhat act in the spirit of a multi-band compressor by reacting to only the frequencies above the high pass filter’s settings-keeping the bottom end from triggering the threshold. This is especially helpful with content that possess a lot of low end. The concept of parallel compression in the mixing process is nothing new to highly experienced engineers. Blending a unprocessed track with a compressed one has some unique and sometimes really beneficial qualities to make a track stand out in a mix. The Nail proudly incorporates this powerful feature into the Mix setting. This allows for the compressed signal (however compressed it might be) to be blended into the dry source signal. This feature opens a lot of doors when it comes to dialing in the right sound. A great example of this would be compressing some drums or a two mix very heavily and only blending it back into the dry signal enough to give the mix some extra needed punch. The Nail was designed with the two buss in mind without sacrificing tracking capability. It is with that the Stereo Link Switch was implemented. 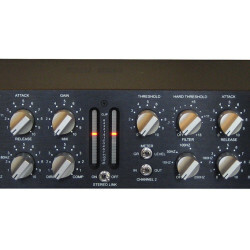 When enabled via the center switch, all functions on both channels will be controlled via channel one with the exception of Gain and Mix settings. The Make Up Gain on both channels works as to be expected, providing up to 10 dB of compensation. The other two switches on each channel toggle between gain reduction/overall volume metering and full channel bypass. The back of the unit has four XLR connectors: two for input and two for output. The NAIL is a great addition to your studio’s working environment and will help enhance your audio signal. A Designs Audio Inc. would like to thank you for your consideration of any products we manufacture. A Designs develops tools to improve the quality of audio engineering and to inspire some fresh, creative engineering into the art of recording. Dimensions 19" x 3.5" x 10"